Product prices and availability are accurate as of 2019-04-12 00:21:20 EDT and are subject to change. Any price and availability information displayed on http://www.amazon.com/ at the time of purchase will apply to the purchase of this product. The Seedz Yellow Crookneck Summer Squash plant produces tender lemon-yellow fruits selected for yield, shape, and quality. The signature bent fruits are best harvested at 5-6" long or smaller for ultimate in flavor and texture. If left to over-grow, this squash can be used as an ornamental gourd. A standard summer squash variety and a warm-season annual. For best results, direct sow after last frost or start transplants at 70-90°F 3-4 weeks before planting date. 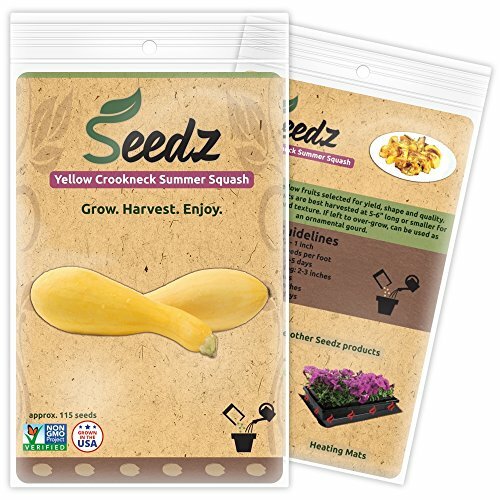 Yellow Crookneck Summer Squash seeds should be planted ½ - 1" deep with a spacing of 2-3 seeds per foot. Allow about 36" between rows. Your zucchini plants should take 3-5 days to germinate. They will be ready to harvest about 50 days from time of planting. Once fully grown and harvested, summer squash is known to be a very versatile cooking vegetable, delicious steamed, grilled, boiled, ground, or raw. Don't be afraid to get creative with this one! WHY THE HEIRLOOM SEEDS SQUASH COLLECTION? 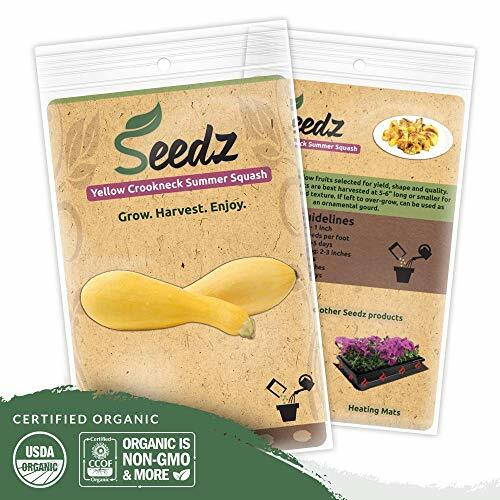 CERTIFIED ORGANIC SEEDS - USDA Organic yellow squash seeds, garden seeds grown right here in the USA! 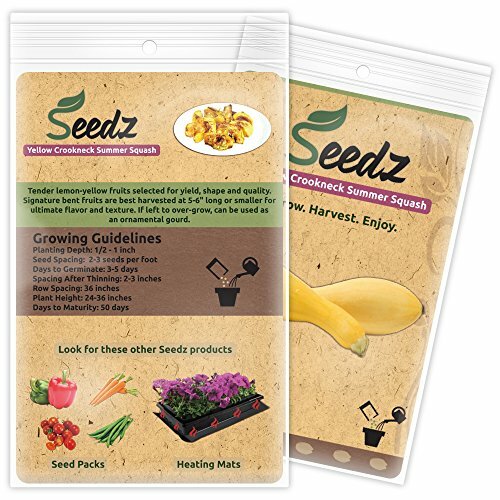 HEIRLOOM SEEDS - Heirloom vegetable seeds, Non GMO Verified; organic heirloom squash seeds. BEST VALUE - Approx. 115 yellow crookneck summer squash seeds per packet means you get the best for less! 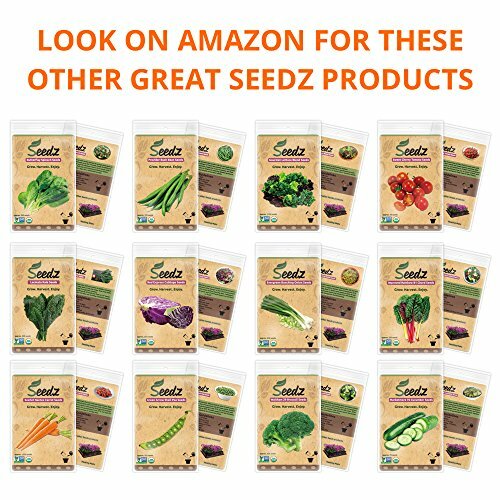 MORE FROM *SEEDZ* - Don't miss our beans, bell peppers, broccoli, bunching onions, carrots, cayenne pepper, cherry tomatoes, cucumbers, garden peas, jalapeno, Lacinato kale, lettuce, okra, pea, radish, red cabbage, spinach, squash, swiss chard, watermelon & more! 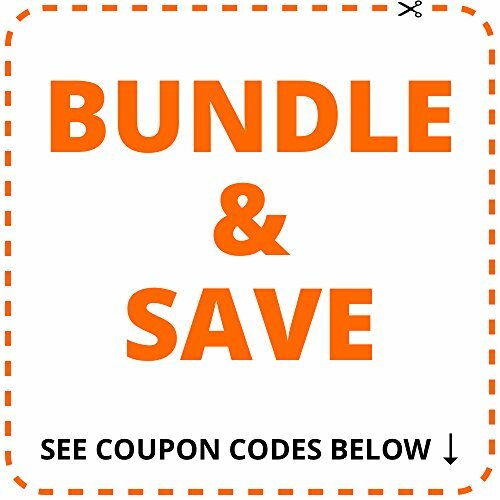 RISK-FREE PURCHASE - Buy with confidence! You're covered by a No-Questions-Asked, 30-Day Guarantee.